This Halloween safety news release has been updated with some additional information. Kingsport Central Dispatch has been receiving numerous 9-1-1 calls from citizens inquiring about times for trick-or-treating. Please be advised that this is not an acceptable use of 9-1-1, but to answer this question, while there is no officially sanctioned time schedule for trick-or-treating, most people consider approximately 5:00 PM until 8:00 PM a reasonable timeframe. 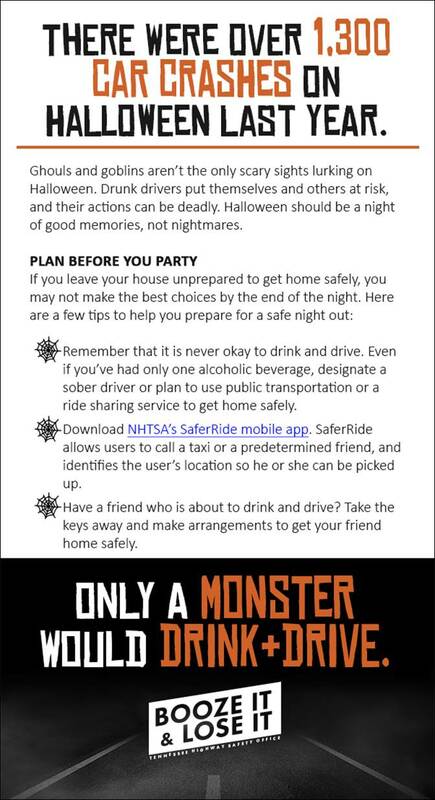 Please also note the included image with a message from the Tennessee Highway Safety Office regarding Halloween parties and impaired driving. With October 31st just around the corner, the Kingsport Police Department would like to offer some suggestions for a safer Halloween experience. When it comes to costumed children and candy collecting, the Kingsport Police Department is a strong advocate of the “Trunk or Treat” and “Fall Festival” concepts as significantly safer alternatives to traditional door-to-door Trick or Treating. Rather than having kids wandering along dark neighborhood streets, knocking on the doors of complete strangers, Trunk or Treat and Fall Festival events are typically held in cordoned-off and well-lit parking lots or enclosed venues and are sponsored by reputable business, churches, or other community organizations. To help ensure adults and children have a safe holiday, the American Academy of Pediatrics has compiled a list of Halloween safety tips. Before Halloween arrives, be sure to choose a costume that won’t cause safety hazards. Tell your children not to eat any treats until they return home. Inspect the candy for any tampering and/or loose or torn wrappers. Discard any goodies that might pose as a choking or allergy hazard.